What​ ​are​ ​equitable​ ​instructional​ ​practices​ ​that​ ​support​ ​the​ ​development​ ​of students'​ ​mathematical​ ​identity​ ​and​ ​sense​ ​of​ ​agency? How​ ​can​ ​we​ ​advocate​ ​for​ ​the​ ​implementation​ ​of​ ​these​ ​practices? Look for updates via email soon regarding the January webinar and view the list of articles and books for the 2017-2018 learning. Through the generosity of our sponsors, we are able to offer several meal functions during the conference. Tickets to each function are limited, based on sponsor participation and are available on a first-come, first-served basis in the order your conference registration is received. In past years, conference attendees requested meal tickets during the conference registration process. We are using a new process to distribute meal tickets for the 2018 conference. You will receive an email in February or March 2018 inviting you to select tickets for the functions you wish to attend. The earlier you register, the earlier your email will come. If you do not receive a ticket for an event, check the program book at the conference for details on waiting-line procedures. Please request tickets only to the functions you will attend. If your plans change on-site and you have a ticket you are unable to use, please return it to the on-site registration booth as soon as possible so that we can accommodate others who would like to attend. We appreciate your cooperation in helping these functions run smoothly. Looking for resources when providing professional learning on formative assessments? 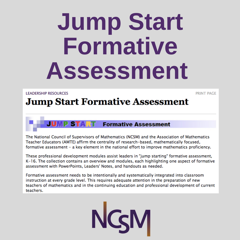 NCSM partnered with AMTE to create professional development modules that assist leaders in "jump starting" formative assessment, K-16. The collection contains an overview and modules, each highlighting one aspect of formative assessment with PowerPoints, Leaders' Notes, and handouts as needed. 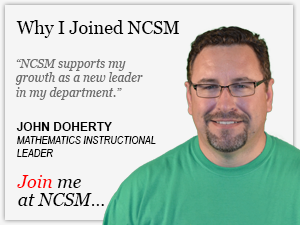 Want a chance to win a free year of NCSM membership (new or renewal)? The first 20 people who email Mona two pieces of information regarding the upcoming 50th NCSM Annual Conference shared in the November eNews will be entered into a drawing for a year membership or renewal. Good luck! Our values become our destiny, and so it was with great care, reflection, and honesty that the board of NCSM continued in October what began in June – the review, discussion, and revision of our value statements. At the fall board meeting we completed that important work. Updating our values was inevitable and a natural consequence of rewriting our Vision and Mission statements. We could not stop at just those two. Where we are headed and what we will do to get there is shaped by who we believe we are. Our work must reflect the values we want to see in our organization so that our vision can be achieved. Support leaders to develop an actionable vision of mathematics instruction consistent with a view of mathematics as a sense-making endeavor. Equip leaders with the understanding, knowledge, and skills to continue their own personal growth, support emerging leaders, and further develop excellence in mathematics teaching. Advocate for each and every student to have access to rigorous mathematics that develops their understanding, skills, and knowledge, along with the confidence to leverage their learning, in order to improve their world. These statements are key as we look forward to the opportunities NCSM has to serve our members and guide mathematics education into the future. They are the values that will become our destiny. The time is nearing! Register now for the NCSM Fall Seminar to be held on November 29, 2017 in Chicago, IL at the Chicago Symphony Center, 220 S Michigan Ave, Chicago, IL 60604. The seminar will run from 8:00a.m. to 3:00p.m. with breakfast and registration beginning at 7:15 a.m. Lunch will also be on-site and part of the seminar. Featured speakers, Nora Ramirez, Linda Fulmore, and Connie Schrock, will provoke thinking, discussion, and action for participants to bring back to lead local professional learning on equity and social justice in mathematics. Participants will be learning together during this seven hour seminar for mathematics teachers, teacher leaders, coaches, consultants, professional developers, department chairs and district leaders of mathematics programs. Participants will also strategically plan to bring back action to their local districts supported by ready-to-use resources. Register now for this exciting and important seminar as we learn together how to lead for equity and social justice in mathematics. Additional information and registration may be found HERE. Online registration closes November 24, 2017. Onsite registration will be available the day of the seminar. 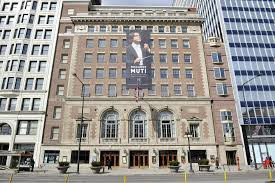 We look forward to seeing you in Chicago on November 29th at the beautiful Chicago Symphony Center!